It’s been a while since I’ve had chicken adobo — the unofficial national dish of the Philippines — but last week I had the jones for some. Must have been that Blue Scholars “Fou Lee” rap my pal Andrew Matson turned me on to: the one with rapper Geo and DJ/producer Sabzi seen shopping at Fou Lee market on Beacon Hill for adobo fixins’, before heading home to cook up a pot for a crowd (check it out here). Since Geo and Sabzi failed to invite me over to partake, and since Andrew waxed so eloquently about how easy it is to buy a chicken, get into the kitchen and get your groove on (something you’ve heard from me a time or two), I decided to do something I’ve never done: make chicken adobo at home. And why haven’t I made this simple dish at home? Because I’ve got an Auntie who does it for me — at the Oriental Mart in Pike Place Market. Trouble is, she’s been on hiatus from the professional adobo-making trade while her “Kitchenette” has been out of commission during the Market’s recent renovation. It will be a couple-few weeks before Auntie Leila Rosas is back at her (new!) stove, deep inside the Oriental Mart’s new-improved digs across from the big clock. Meantime, I found her in the long-lived family store last week, willing and able to provide me with a recipe as well as the vinegar (Silver Swan brand, from the Philippines), light soy sauce (“Use this! Not that heavy-duty Kikkoman!”) and atsuete (annatto powder, for color) needed to get the job done right. Of course, I already knew there were umpteen ways to make chicken adobo, depending on where you live, what you like and who’s your Auntie. Don’t believe me? Read this royal riff on the subject, courtesy of Sam Sifton — who also provides a recipe. Or this, from the always eloquent Angela Garbes. Or listen to this hilarious guy, who tells it like it is and shows you exactly how he does adobo at home, absent the atsuete. Anyway, I pulled out my Dutch oven (Lei says to use a non-stick pan, but . . .) and her post-card recipe (winging it on the details), and even applied the “secret” trick she employs at home though not at work, where she’s cooking for a cast of thousands: removing the chicken from its stew-pot and pan-frying it toward the end of the cooking process to give it a nice glaze. So, how did my adobo come out? Pretty good. But not as good as Auntie Lei’s. Which is to say, you’ll soon see me — and Leila’s biggest fan — sitting at the counter at Oriental Mart next month, where the finishing touches are being put on the Kitchenette as I write. Granted, mine would never taste as good as Auntie Lei’s. And that fact has nothing to do with the ingredients, her expertise, or the recipe I use. It has everything to do with being in her presence at the Market, listening to her as she carries on speaking Tagalog with this customer or that; watching her wrapping take-out orders for Filipino cops and cruise-ship workers; busting her sister Joy’s chops as they work the register; yelling “Mom! Answer the phone, I’m busy here!” to Mila, who’s minding the store; making salmon soup; washing dishes, and giving me the business as I eat. So, the bottom line? 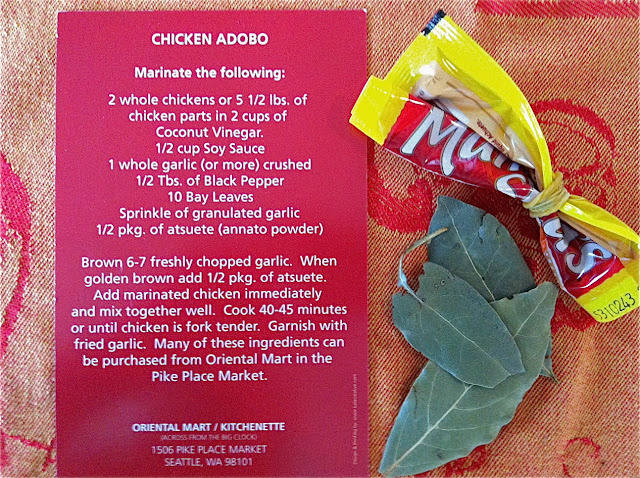 If you need some advice about making chicken adobo, there’s plenty available. But here’s the basics, below, courtesy of Auntie Lei. And if you’ve got any chicken adobo-making advice for me or my Eaters, or want to share your favorite place to get a nice homey plate of that Filipino comfort food, feel free to chime in here in my comments box.